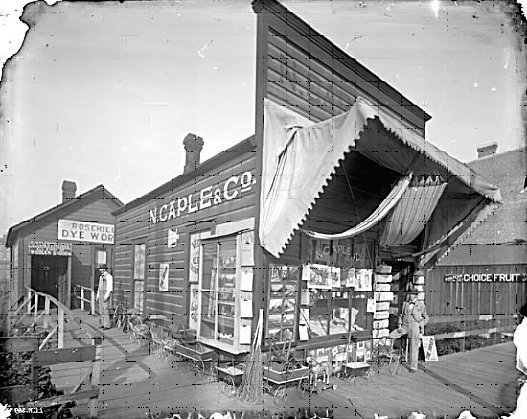 Here’s another shot a few years later of the Granville and Pender junction in a 1906 Phillip Timms image at the Vancouver Public Library. The Post Office and Customs House is still there on Pender, and there’s a new building on the corner with Granville. It was home to F W Welsh, grocers, and P Burns, butchers. Just out of shot was a building shared by a dressmaker and tailor where Emil Guenther, an architect, had his office. The building went up in 1899, and it could be by C O Wickenden who designed a building on Pender for a Mr Tompkins that year – although nobody called Tompkins appear living on Pender in the street directory that year or in the following years. It didn’t last very long as Somervell and Putnam’s Merchants Bank (later a Bank of Montreal branch) was built in 1915, and later converted to the Segal School of Business by Simon Fraser University. Underwood, McKinley, Wilson & Smith’s Pender Place now occupy the Post Office spot. After the Post Office operations moved out, the building became the Dominion of Canada Assay Office. 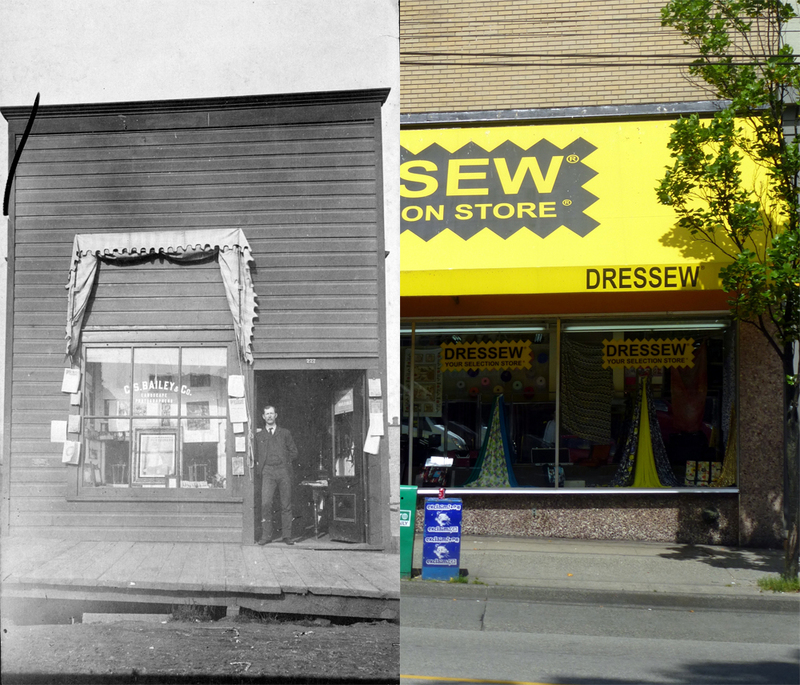 Here’s the corner of Granville and Pender Streets around 1895. That’s the new Post Office and Custom House building, and Jonathan Miller was the postmaster. C O Wickenden was the architect – he was busy around that time as he was also designing the new Christ Church in Downtown. The building was replaced once the new larger Post Office was completed on Hastings Street in 1910, and now the corner features the 1973 Underwood, McKinley, Wilson & Smith designed Pender Place office towers. The building on the left just edging into the picture is the 1916 Bank of Montreal, these days SFU’s Segal School of Business. There’s another post that shows the same corner a few years later.